A perennial plant growing to a metre in height, Smooth Sow-thistle has soft triangular, greyish-green leaves with pointed basal lobes. The compound yellow flowerheads have yellow Dandelion-like flowers 2 to 2.5cm across (when fully open) that are borne in lax clusters. Smooth Sow-thistle, also known as Common Sow-thistle, is widespread and abundant throughout Britain and Ireland. This species is native to Europe and western Asia. Elsewhere it is an introduced alien plant, and it is considered to be seriously invasive in some countries, including Australia. 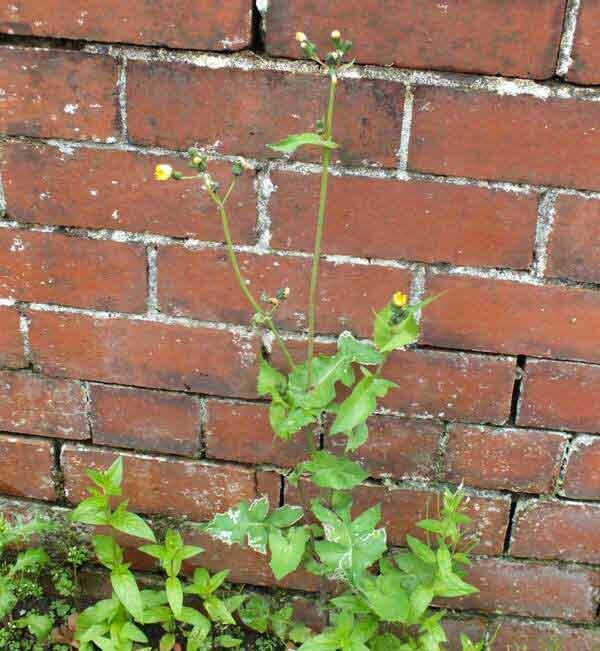 This is a wildflower of urban roadsides, wasteland, arable field margins and other disturbed ground. 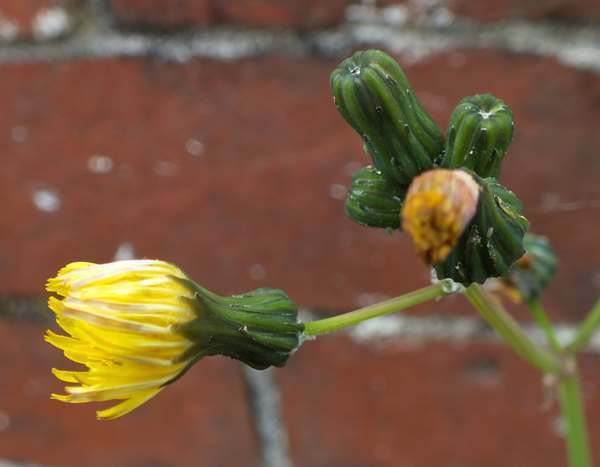 Smooth Sow-thistle flowers first appear in May, but you may see this wildflower blooming as late as November. The common name refers to the liking of pigs for this plant and the similarity of its leaves to those of thistles. The prickly sow-thistle, Sonchus asper, is similar but its leaves are generally greener and with sharper spines. Smooth Sow-thistle and Common Sow-thistle often hybridise, resulting in plants with slightly prickly leaves. There are many other yellow members of the daisy family with flowers similar to those of the Dandelion. The sow-thistles are easily distinguished by the shape of their leaves. The plants shown on this page were photographed in West Wales in August.